All was as described, and we had a lovely time in Colorado. Thanks for everything. Great location, close to lift. Condo is in a great location, steps away from bottom of Quicksilver Lift. Only downside to condo is that there is only room for 3 people to sit comfortably in living room after getting in off the slopes. More than 3 and someone has to sit at the kitchen table. Great home with plenty of amenities. Quiet area and not far from the ski slopes. Home has wonderful kitchen with ample supplies. Comfortable stay. Well consider again on next trip. 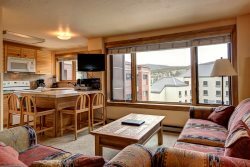 Nice apartment with good amenities and very close to both restaurants / Main Street and the slopes through the Quicksilver Super 6 lift. You can also rent/pick-up gear within the same building, which was great. Great place. It was the perfect size for our group, close to many stores, restaurants, ski rentals, you name it. The place is centrally located to many ski resorts, so you have options. We had a blast. Wonderful way to ski Breck. It was very nice. Terrific views - across from ski lifts and hot tubs. Will be back! Great location! Allbthe amenities of home. Very convenient to slopes, shops and restaurants. We had a wonderful family vacation in Big Timber Home! This beautifully decorated, spacious & comfortable home was exactly what we were looking for! Conveniently located with beautiful mountain views, we would definitely love to return! Great Condo - Amazing View! We stayed in this condo the week of February 12th, 2018. This was our first year staying on Breckenridge property - totally worth it! The location is ideal and cannot be beat. From the condo, it was only a 5 minute walk to the Quicksilver SuperChair, located at the base of Peak 9. The heated underground parking was very convenient and worth the additional cost. Main Street is also close by, where you can check out many shops and restaurants. The view was incredible and the hot tubs were perfect after a day of skiing! If you are looking for an exceptional dining experience, consider Sauce on the Blue in Silverthorne, CO! Very close to the slopes! All the individual emails with specific instructions on where to go and what to do to check in and out were very helpful. Skiing. Loved the place! Close to shuttle route. Cozy little place with all the amenities. Great condo and great location! Excellent choice! We thoroughly enjoyed our trip, and were very pleased with the accommodations and proximity to the Snowflake lift and 4 O'clock run. Lots of fresh snow and the sun setting over the mountain added to the trip. Would definitely book this location again. Wetterhorn #3201 could not be in a better location. Exactly what we wanted, walkable to the slopes, ski rentals in the building, walkable to restaurants and bars. The unit is very clean and well kept. We enjoyed our stay. Note, check in is not onsite. The management makes this very clear. Enjoy. The cute condo, fantastic location and professional management were amazing. We used The Breeze for our rentals right down stairs in our condo building and stored skis there overnight also. It was so convenient and had a nice staff. Only complaint we had is the bedroom with the queen beds was so warm. We even had to open a window to help after turning the thermostat down. Not sure if there is a solution to the problem. Hoping they will look into it. Other then that it was great trip and we would rent again! So close to everything! Right out the front door you are at the chairlifts, short walk to dining and bars! Great location! Unit was just as explained. Host was accommodating and responds super quick. Everything was wonderful! Incredible location, great service, easy check in/out. Very happy!